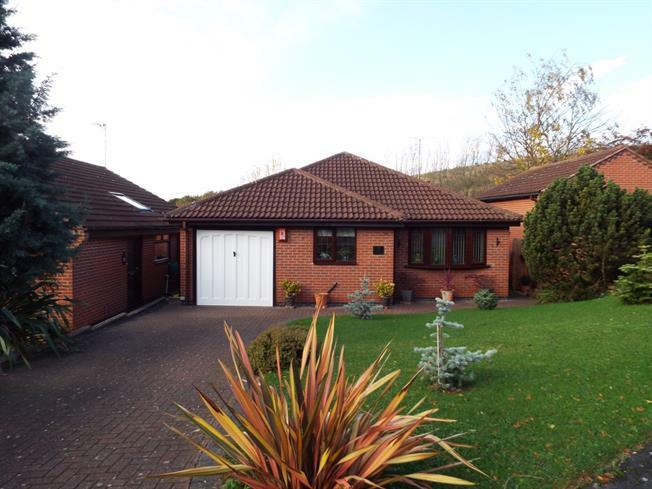 3 Bedroom Detached Bungalow For Sale in Nottingham for Asking Price £280,000. Bairstow Eves are pleased to bring to the market this stunning three bedroom detached bungalow situated within a very sought after location. The bungalow comprises of: entrance hall with access to garage, living/dining room with feature fireplace, large rear conservatory with French doors to garden, fitted kitchen, modern bathroom with separate shower and three bedrooms with the master bedroom having fitted wardrobes and separate en-suite shower room. The property also benefits from double glazing, gas central heating, landscaped front and rear gardens and garage. UPVC front double glazed door, double glazed uPVC window with frosted glass, radiator, part vinyl part carpeted flooring, built-in storage cupboards, original coving and ceiling light. Roll top work surface, fitted wall, base and drawer units, one and a half bowl sink with mixer tap, integrated oven, integrated gas hob, overhead extractor and space for fridge/freezer. Double glazed uPVC window facing the front, radiator, vinyl flooring, tiled splashbacks and ceiling light. UPVC double glazed door leading to conservatory, double glazed uPVC window facing the rear overlooking the garden, two double radiators, pebble effect electric fire with beautiful surround and marble hearth, carpeted flooring, original coving and ceiling lights. UPVC French double glazed doors opening onto the garden, uPVC double glazed door, double glazed uPVC windows facing the rear, radiator, double radiator, carpeted flooring and ceiling lights. Double glazed uPVC window facing the rear. Double radiator, carpeted flooring, fitted wardrobes, original coving, wall lights and ceiling light. Low level WC, single enclosure shower unit with electric shower and wash hand basin. Double glazed uPVC window with frosted glass, heated towel rail, tiled flooring, tiled walls and ceiling light. Double glazed uPVC window facing the front, radiator, carpeted flooring, original coving and ceiling light. Double glazed uPVC window facing the side, radiator, carpeted flooring, fitted wardrobes and ceiling light. Low flush WC, panelled bath with mixer tap, single enclosure shower unit with electric shower and vanity unit with wash hand basin with mixer tap Double glazed uPVC window with frosted glass, double radiator, tiled flooring, tiled walls, original coving, ceiling light and extractor fan. Up & over door, plumbing for washing machine and combination boiler.